'RETFORD' on the front. A CRESTED CHINA MINIATURE VASE WITH A CREST AND. AND 'MARGATE' on the front. On the base; SHELLEY CHINA, LATE FOLEY, 'Model of. 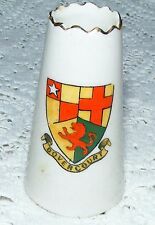 A CRESTED CHINA MINIATURE VASE WITH A SHIELD. Slight wear on shield. 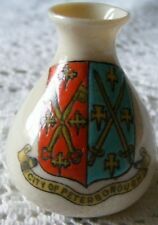 Arcadian 1924 crested china for City Of Peterborough, miniature model of a vase. In very good condition, NO chips or cracks, just worn gilding worn off on the top edge. Height 2" inhces, base diameter 1" inch. Weight before packing 1st class packet post recorded delivery 18g. Items Classed as BOXED means the original box it came it. Items classed as un-boxed just means it will be packed in a suitable box or packaging . We use a mixture of re-cycled and new materials for packing and take a pride in the fact that we pack well. MADE BY THE CORONET WARE, MOST PROBABLY FOR ARCADIAN CRESTED WARE.